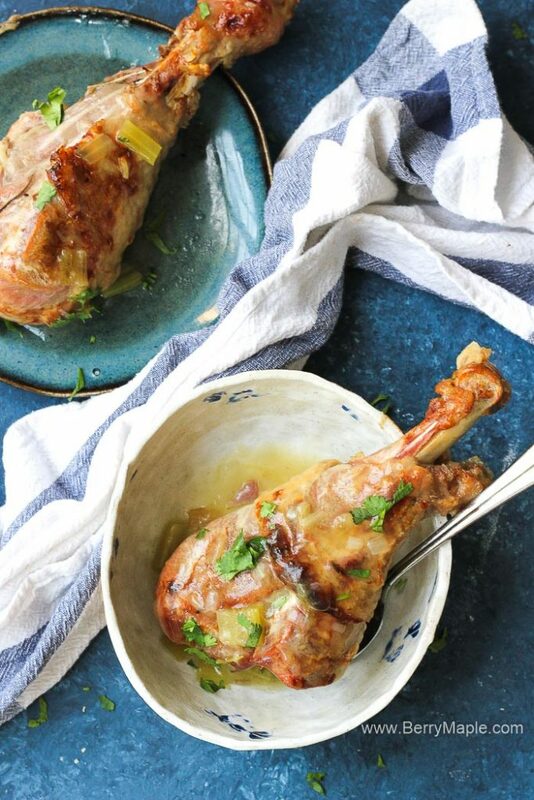 Delicious juicy instant pot turkey legs cooked in no time! Easy (great for Christmas!) recipe for your pressure cooker, you will love it! Holidays are right around the corner. What i love most about it is how much variety do we have nowadays! We can cook so many dishes quick and easy all at once- thanks to Instant Pot and other Instant Pot accessories. When it comes to turkey, well, not everybody loves to cook a whole turkey! Or maybe you want just a turkey recipe for two ? Here is an idea, guys. 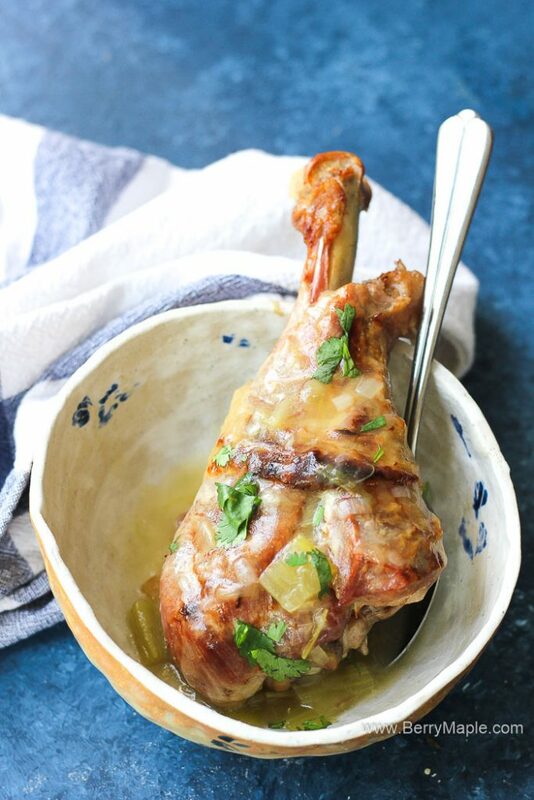 Grab your Instant Pot, two turkey drumsticks , count 22 minutes and voila! The holiday dinner ( or any weeknight dinner) is ready! So easy and flavorful, add mashed potatoes and some steamed vegetables for a full meal and enjoy! 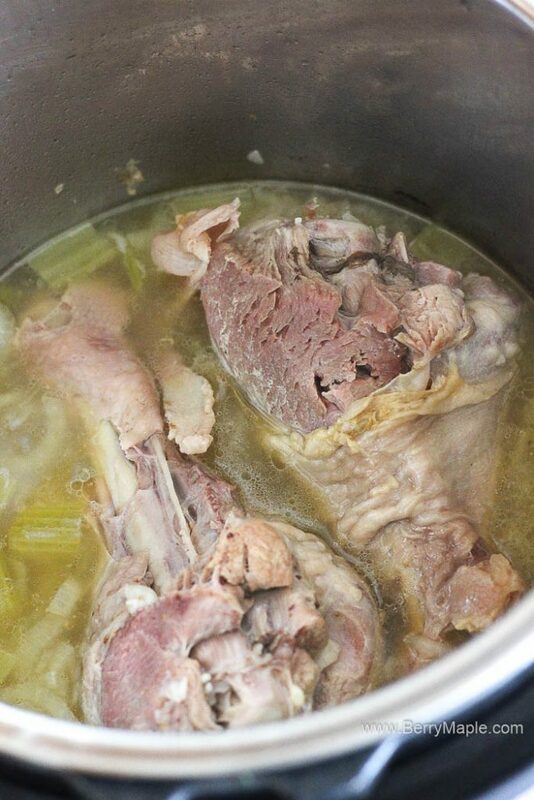 How to cook Turkey legs (drumsticks) in the instant pot. First you need to get two nice big turkey leg, i used drumsticks. Marinating is not really required because legs are not getting dry really. Add about 1 cup of water with chopped celery sticks, onions, carrots if preferred, herbs and salt and pepper. Cook on manual for 22 minutes ( high pressure) and quick release . The smell will be amazing! Take turkey drumsticks out. Mix cornstarch with some water. Add to the pot and cook on Saute for about 5-10 minutes, until thick enough. Meanwhile, if you prefer some crusty skip and golden color, broil turkey legs for about 5 minutes in your oven . In will make your dish look much more comforting! Just look at that! How crispy and yummy! Ready to serve! Pressure cooker in general is a fantastic tool for quick and flavorful meals. 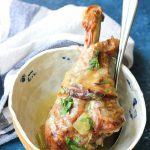 Turkey legs in instant pot is not only a fantastic holiday or everyday dish, its an ultimate time saver! Get ready for your Christmas table with this Instant Pot Christmas recipes! 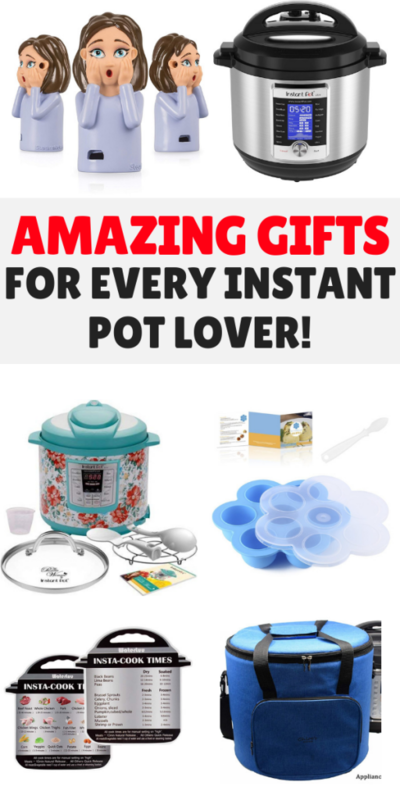 Also check out these Best Instant Pot Accessories that Everyone Should Have. 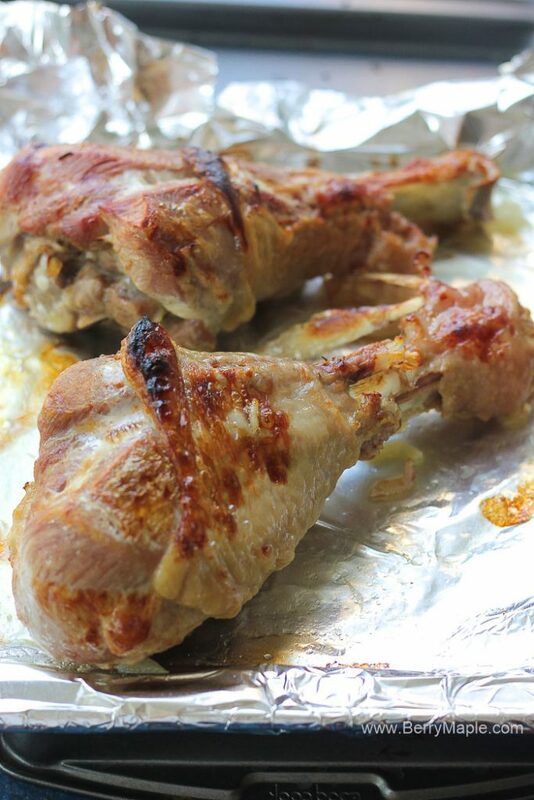 Delicious juicy instant pot turkey legs cooked in no time! Easy recipe for your pressure cooker, you will love it! Place drumsticks in to the pot, add cup of water, chopped celery and onion, spices, salt and pepper and close and lock the lid. Set on 22 minutes MANUAL. Quick release once its done. Take legs out and turn on SAUTE mode. Separately mix cornstarch with 2 tablespoon of water. Add it to your pot broth. Cook for about 5-10 minutes stirring. Gravy is ready! I did this recipe in the small instant pot with 3 turkey legs. The pot appeared sealed but it wasn’t, so it nearly went dry. I would warn people to make sure the legs fit in below the fill line, or have the end of the bones cut off. Still tasted and smelled great! Do you think this can be done starting with frozen turkey legs? How much would you increase the time by? 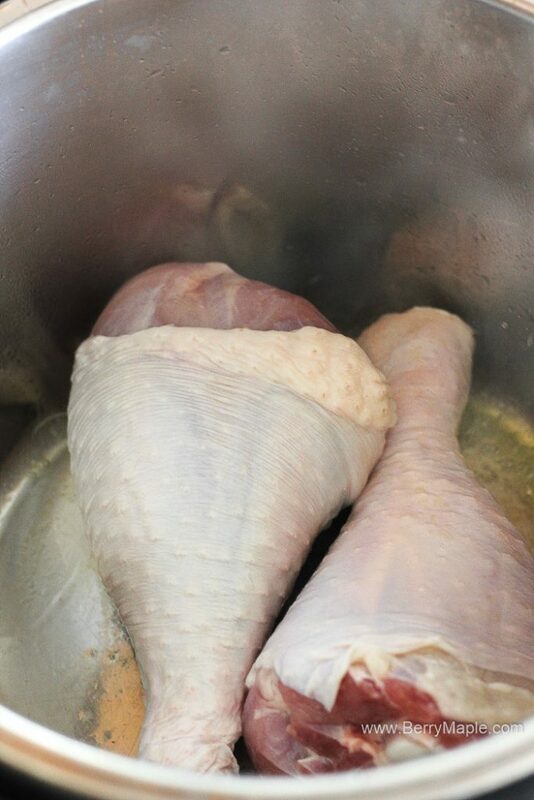 I’m making 3 turkey drumsticks. Do I increase the time? Hi! No, you don’t need to increase the time . Hi, I’m cooking one turkey leg, what do you suggest for the cook time? Thank you! Hi. Is the time the same w/ more turkey legs? This is a fabulous quick and nutritious dinner idea. Thank you so much for teaching me another simple and delicious Instant Pot recipe! These look so succulent and delicious!